Kodak ScanStation 100 network scanner is a network connected A4 scanner combining high quality scanning of paper documents with intuitive operation, enabling people to share documents via e-mail, save them to a network folder, send them to a network printer or copier, or store them on a portable USB drive - all without the need to be connected to a dedicated PC. Kodak ScanStation 100 operation is controlled with the colour touch screen. It scans up to 25 sheets per minute in monochrome, greyscale or colour, simplex or duplex, and outputs images in TIFF, JPEG or PDF format. Images can be previewed on the screen, and the USB port may be used to store scanned documents on compatible memory media, alternatively load personal settings to the ScanStation. 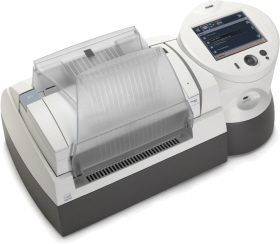 The document feeder holds up to 50 sheets and and up to 863 mm long documents can be scanned. An alternative feeder for front feeding is included and for easy access the control panel may be rotated up to 90 degrees anticlockwise.